Want to check a full set of tools ANY SEO absolutely needs? No more and no less: these FOUR tools make all SEO baby-simple. Picture your web site on the #1 spot in Google or any other search engine? Look forward to getting tons of traffic coming every day and converting into rocking sales? With this super bundle of tools that today saves you $200, you not only achieve the boldest SEO goals; you get software that makes SEO job a snap, even if you're a newbie. All in all, your purchase totals to as little as $299, instead of $499 , and even these $299 are completely safe to be worthily-spent and can be easily refunded. Want to read what's in the bundle? If you were told there's a money-printing machine, would you believe? So what do you think is there? Four cool money-making tools! You've got a keyword you want to rank well for. You needn't even know who's the #1 for it today. At least because soon it's going to be YOU! You fire up SEO SpyGlass, and it gives you on a silver platter each single step that your competition took to win the traffic-rich Google position. Moreover, the tool gives you simple recommendations on how YOU quickly outrank your competitor — and reside on the Google top! You already picture thousands of visitors buying your product or service, as your web pages are just a step from getting a top Google position. Right now, is your site going higher at an ultrasonic speed? Or did it get stuck and needs your quick action? Instantly check where you rank, for all of your keywords, in 249 search engines! Be ahead of the wave at any moment, and grow your site's performance. Plus, generate profitable keywords like a Pro! A tremendous landing page is as close to making a huge sale as you, when making a paycheck for $91,490 at the dealer's, are close to driving a shining-new Dodge Viper. Fire up WebSite Auditor, and in a second see how your landing pages can get lasting Search Engines love and make an irresistible temptation for visitors to buy. Make landing pages that rock! What's the #1 thing for getting high and solid rankings? A well-run linking campaign with bunches of good and reliable linking partners. LinkAssistant does link building work for you! It'll find and manage hundreds of premium-quality link partners, and help you get link love and swiftly drive targeted traffic to your site. Why getting these four tools today is a great advantage? The commonplace truth is, SEO brings huge money, but it takes time before it really works. Dramatic changes may come as soon as in 3 months, and rarely it'll take up to 12 months to get the best spot in the desired Search Engine. The good thing here: you don't have to work like crazy all this time. 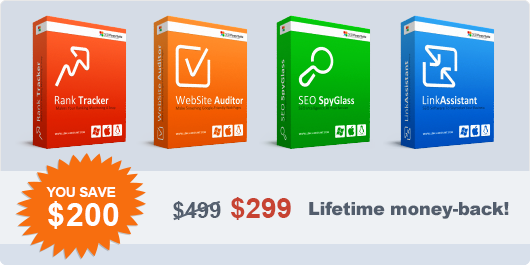 Once you've got this amazing software bundle, doing SEO will take hours, not weeks. With the SEO in Practice guide you're reading, website promotion is impossible to fail. And with the four tools you see here, optimization will eat up just a tiny portion of your time. So you get an $200 discount right now and you stay safe with a life-long money-back guarantee. Only a hammerhead would miss a chance like this! Don't delay to use our limited-time discount and grab the four great tools, instantly! * A full money-back is issued if you performed all the guidelines of SEO in Practice and applied the four SEO tools you're getting now and this did not help increase your rankings. For details, view our SEO software bundle refund policy. ** The standard 30-day money-back guarantee also applies to the bundle without any conditions.